The main Pentagram of Blood identified by Sollog in his writings is the Pentagram formed by ancient Ley Lines or Solstice Lines of Energy that covers North America. This Pentagram has been written about by Sollog for many years. In the Summer of 2016 Sollog released a Music Video titled Pentagram of Blood about this Phenomena and then 13 Tragedies he sung about happened on this Pentagram within 113 Days. The Fort Lauderdale Airport Massacre struck the Pentagram of Blood and Sollog warned of such an event and even named the shooter in his Terrorism Prophecy. These FIVE LINES OF DEATH are where pretty much every major loss of life event in North America the past twenty years has happened. Even the JFK Assassination and death of JFK Jr struck on this Pentagram of Blood. 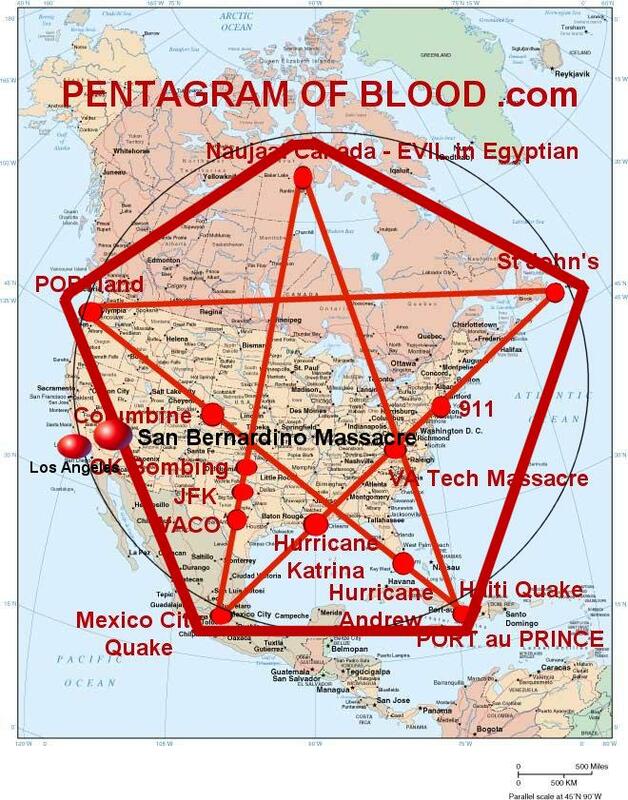 An enclosed Pentagram of Blood by a circle or straight lines puts the whole West Coast of the USA into play since the San Andreas fault runs through the line that connects the Portland and Seattle area to the Pyramids near Mexico City. 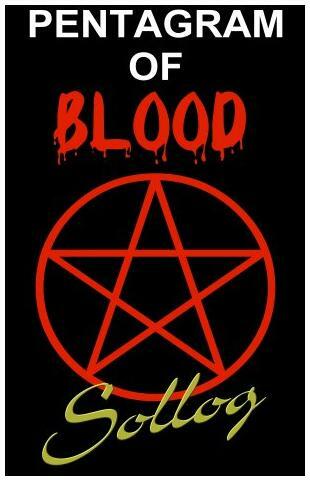 To learn about the PENTAGRAM OF BLOOD and the long history of how humans have died on ancient Solstice Lines of Energy read the BOOK PENTAGRAM OF BLOOD. Recently Sollog released a Music Video about the Pentagram of Blood Phenomena under his artist name Rex Luciferius. Released on the Summer Solstice of 2016 the maps on this site were featured in the video. The areas highlighted by Sollog in his Music Video had 13 mass loss of life tragedies strike the USA Pentagram of Blood in the Summer of 2016 within 113 Days. Sollog’s new Albums Cross Roads and Prophecy had over 30 Million Plays this summer on SoundCloud alone. 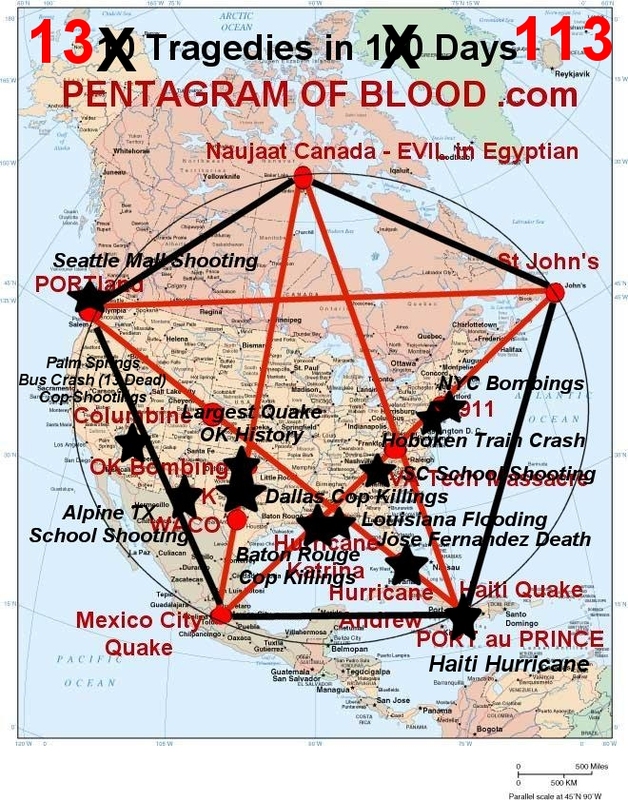 Here is the new map of the USA Pentagram of Blood showing all the new tragedies in BLACK STARS that happened in the Summer of 2016 after Sollog aka Rex Luciferius sung about the Pentagram of Blood.